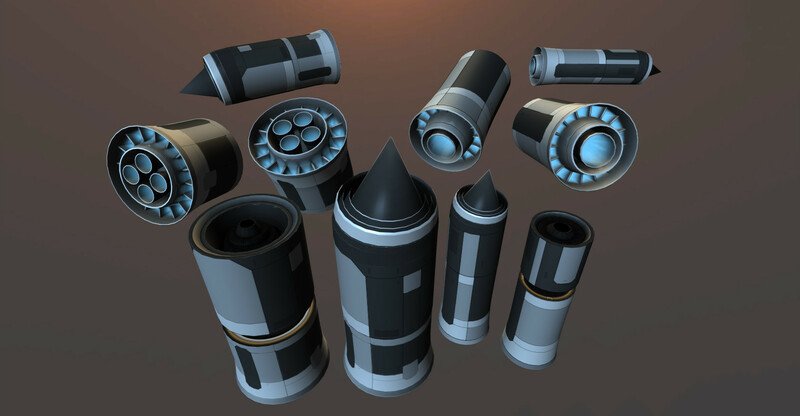 This pack vastly expands a selection of parts, in particular with high-quality spaceplane components such as new engines, cockpits, wings and fuselage systems. Double-check whether you are using KSP version 0.22 or higher. Your root KSP folder should already contain GameData and Ships folders. Overwrite them with folders from the archive. Do not, under any circumstances, extract just GameData/B9_Aerospace/Parts folder alone, the mod won't work this way. With a proper installation, you should have multiple new folders in GameData alongside with Squad folder that was there originally. Do not try to move the part folders elsewhere or sort them by category subfolders, that will break resource linking in all configs. You don't need the Source folder for the mod to work, it contains source code for all the plugins. Need help with aircraft design? Read this excellent post by keptin. * All textures converted to the uncompressed TGA format and will remain in it from this version onwards (previously, the PNG was used). Memory footprint in the game is unchanged. The benefits include sliced by approximately half, the compressed archive size being slightly smaller, and mip maps being generated properly by the engine. * All parts are hooked into the tech tree. Parts aren't dumped to a single node, unlock gradually and, as possible, are arranged in a way that provides enough parts for you to build usable crafts at all stages of the tech tree progression. No SABREs at tier 3, no bizjets at tier 8, no shuttle control surfaces without shuttle wings and fuselages. All parts should also be compatible with the modded tech trees, as they usually preserve the original node names our configs are linked to. * Added new landing gear parts that blend into the parent parts and fit a huge variety of aircraft. Choose between twin-wheeled and single-wheeled configuration, two different clearances and two different colors (allowing them to blend perfectly with all-purpose gray or plated black pieces). All landing gears are equipped with togglable electric motors and can be steered. * Added new solid rocket separation boosters to replace the awkward stock one. 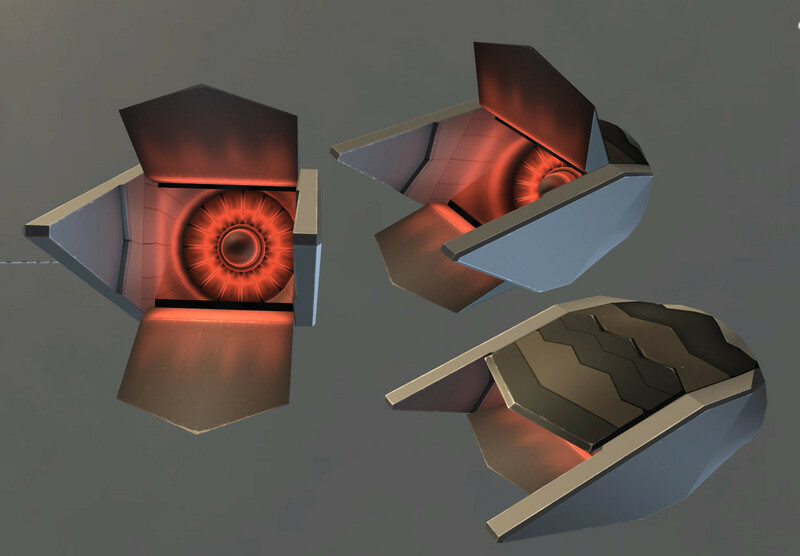 * Added the shielded variety of A1 light. It is mostly intended for use as the landing light, as new gear models, in contrast with stock ones, have no light sources to avoid breaking through per-pixel light limits and improve performance. Comes in two colors, same as the landing gear set. * Added the 1.25m (MK1) aerodynamic junction part. 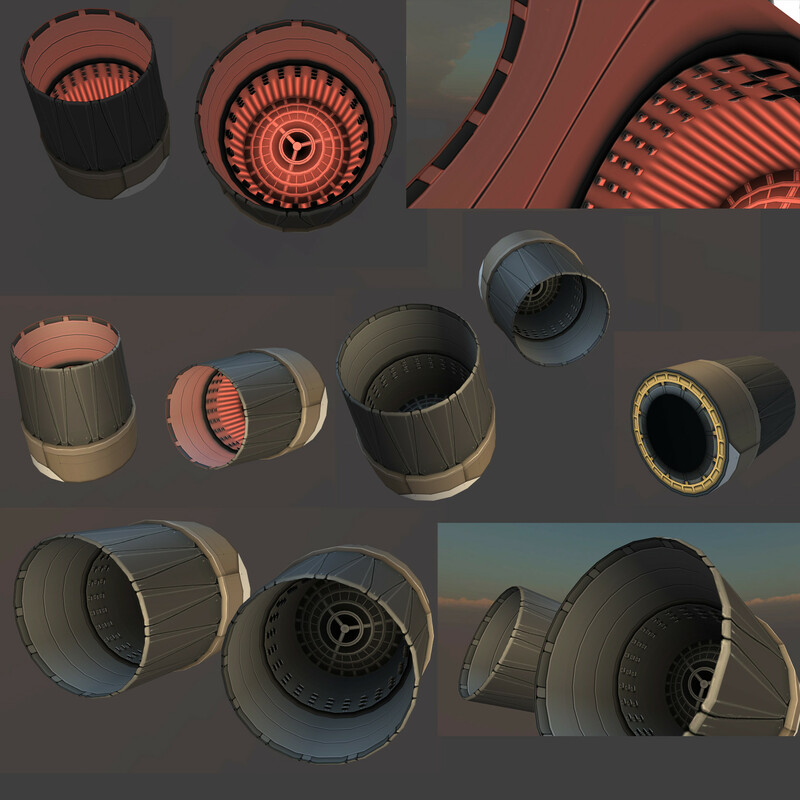 Useful for nice transitions to radial engines, fancy boosters on rockets, and stylish UAV glider noses. * Added new struts to finally retire the stock ones from every single craft. First variety is functionally identical to the stock one, just a bit more sturdy 	* and quite better looking. Second variety is where it gets interesting: it's a strut part with an invisible middle piece. Exceptionally useful when you 	* want a clean design without all the messy cables: basically, you just place two very suble blocks and imagine how structural integrity was improved somewhere inside the craft. Clean and performance-friendly. Oh, those new parts have no shadow casting, - that might help with FPS on heavy crafts which typically use hundreds of struts. * Added MK2 cargoholds. Not very roomy, but they can still hold some useful payloads like 0.625m satellites or science modules, finally making the MK2 fuselage system useful for useful SSTO designs (!). * Added the smaller 5-port omnidirectional RCS blocks in line with already existing linear and 12-port varieties. Added dark-colored versions of RCS parts to allow them to blend with the shielded areas of the fuselages. * Added three new winglet sizes (2.3x1.6m, 3x2.2m, 3.2mx2.75m) and two new stabilator sizes (2.3x1.6m, 3x2.2m) to completely phase out any use of stock control surfaces from the crafts (2.3x1.6m is equivalent to the stock winglet in size). By the way, all 12 non-modular wing parts (stabilators, wingtips and winglets) in the mod are still using one single texture and maintain perfectly even texel density. No stretching, no duplicates, no distorted proportions. * Added new SH wing module (1x4m) to close the last remaining gap in the system. Added the static trailing edge parts that can be added to the backside of SH modular wings, for the first time in history making control surfaces look passable without forcing you to cover all trailing edges with them. Seriously, those a very nice looking. Oh, and control surfaces no longer have a weird orange cross sections on the side. * As separate ASAS/avionics parts became unnecessary since 0.21, all parts related to them (inline/radial/nosecones) are moved to the role of probe cores or sensor packages for the science system. Only exception is the plain MK2 nosecone, which is now decorative. * D-175 Strugatsky: Long-range, short-takeoff subsonic cargo transport. * BRV-4 Heinlein: High-performance heavy SSTO, trading off cargo transport capability for the generous fuel reserves. * I8-L Bradbury: High speed atmospheric crew transport. 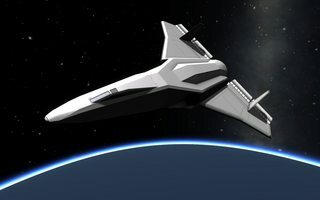 * SCDV Vonnegut: Advanced SSTO with the cargo transport capability. * TR7 van Vogt:  Light and fast MK2 SSTO with the cargo transport capability. * UAS-1 Barnard's Star: Extremely maneuverable lightweight UAV with thrust vectoring. * UAS-2 Polaris: Stable lightweight UAV. * UAS-3 Centauri: Extremely maneuverable MK2 UAV employing RCS and thrust vectoring instead of traditional control surfaces. * UL-1 Kornbluth: Subsonic personal transport with generous lift and convenient landing gear configuration. * VX-1 Vance: VTOL and RCS technology demonstrator, highly maneuverable and incredibly stable for it's class. * YF-28 Haldeman: Four-engine thrust vectoring fighter jet with extreme pitch and roll authority. 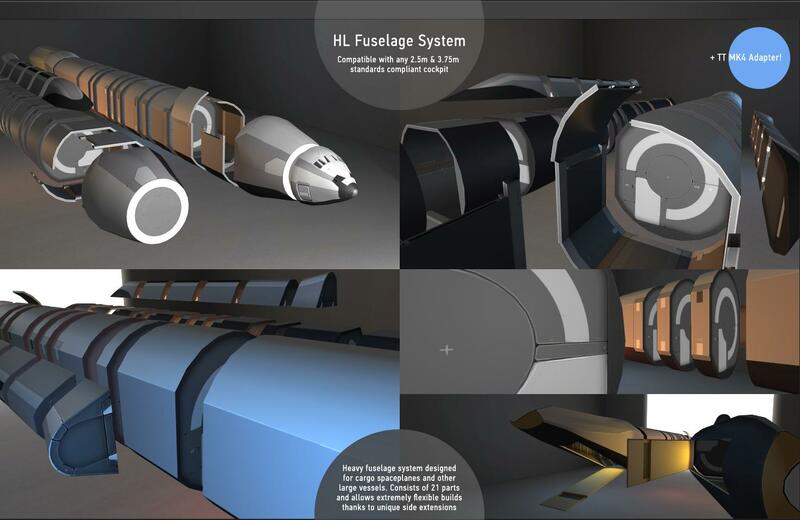 * Increased connection forces of the laggers and railings, fixed the crash tolerances. * Added the specular maps to a few parts that lacked them. * Hypersonic mode on S3 cockpit returns and works as intended again. * Balance changes to the SABRE Engines: Slightly less efficient air-breathing mode performance with greater thrust, slightly more efficient LFO mode with decreased thrust. Makes the engines less viable for prolonged gliding in the atmoshpere and more useful for space stuff different from barely circularizing in the LKO. * Air consumption of the turbojet engine is increased. * Action names on S2 crew part revised to fit into the fields. * R1A air-powered RCS linear port ISP tweaked. * VTOL engines rotation and steering inverted, enabled the velocity curve on VA1 and disabled the gimbal on it. * Air brakes connection strength values added. * Thrust vectoring engines are no longer trying to participate in roll control when they don't have a symmetrical counterpart. 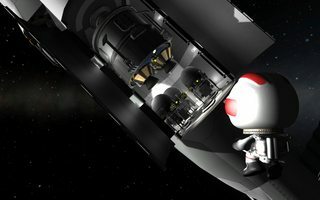 * Compatibility patch for KSP 0.21. * ASAS/avionics module discontinued, all twin control parts are now using 0.21 SAS, differing only visually. * SAS parts changed to work with 0.21 reaction wheel system, appropriate tweaks made, including changed names. 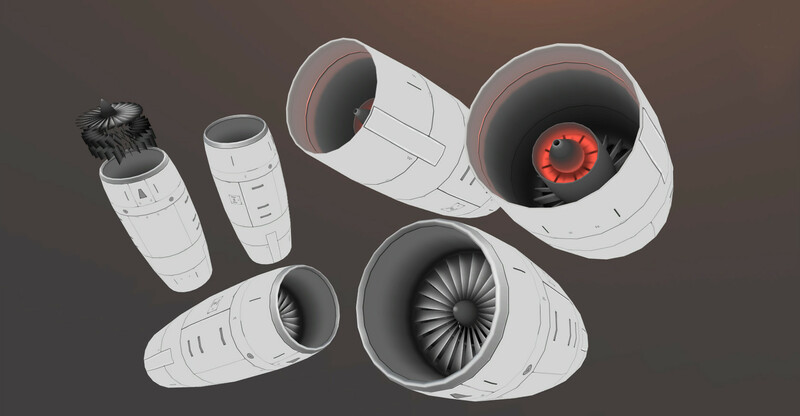 * Turbofan engines updated to use new thrust-based spin mechanics. * Example crafts updated to have electricity sources to account for 0.21 SAS and reaction wheels using it. * Added an inline stack decoupler. * Replaced ExsurgentEngineering.dll with a new version, now compatible with ModuleManager. Thanks to careo for the fix. * Hotfix for P4 & P8 structural panel configs. * Fixed raised MK1 tail model to show up properly instead of straight one. * Cargo bays should now be detected properly by FAR, shielding the contents and preventing cargo crafts with payloads from flying like bricks. * Intake stats recalculated using a different formula (factoring the root of mass / 0.01 for unitScalar, and factoring (unitScalar*sqrt(coeff))/(unitscalar+1) into the speed). Nothing changed gameplay-wise, but that will fix improper flow reporting in KSP context windows. Nope, RBM intakes never were 10 times more powerful than others, KSP lied to you. It will continue to lie about air speed though. * Fixed S2 Body 2m model. * P4 and P8 reinforced structural panel nodes changed. While stock bug that forbids parenting with nodes on more than one axis is still present and unsolved, axis that works should be vertical now, which contains most useful nodes suitable for adapters and other stuff. * SCDV Vonnegut example craft updated to use new wing models. * S2W 3.75m adapter no longer contains LFO in structural version. * SABRE M Precooler node sizes fixed. * Included source files folder that was missing from R3.0c (uh-oh). 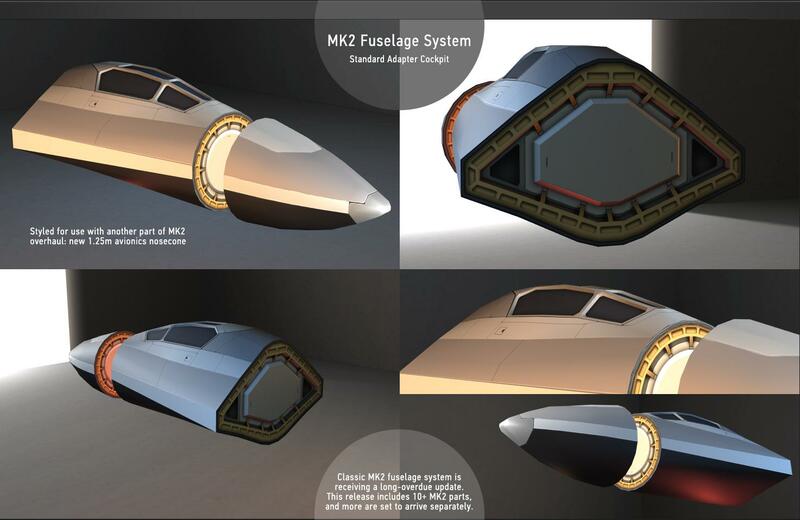 * Fixed MK2 monopropellant tank fuel type. * Fixed SABRE body parts attachment nodes and naming. * Changed folder name to GameData to avoid issues on Linux. * Total part count now at 175. * Everything converted to be compliant with 0.20+ data system. * Memory usage and disk space usage reduced more than x2.5 thanks to file referencing available in 0.20+. * The mod now occupies only 73mb (!!! ), less than R2.5 and less than stock parts. Loading is faster than for all stock parts combined. * Mass, capacity and connection strength values on parts were updated using a better algorithm. * Lift, drag, mass and connection strength values wings updated using a better algorithm. Stuff falls apart quite more hesitantly now. * Vastly updated, improved and expanded selection of example crafts. * Added TFE731 small subsonic high-bypass turbofan engine with surface-attached pylons in straight and raked variants. * Added CF34 large subsonic high-bypass turbofan engine with surface-attached pylons in straight and raked variants. Perfect for heavy lifting, now used on D-175. 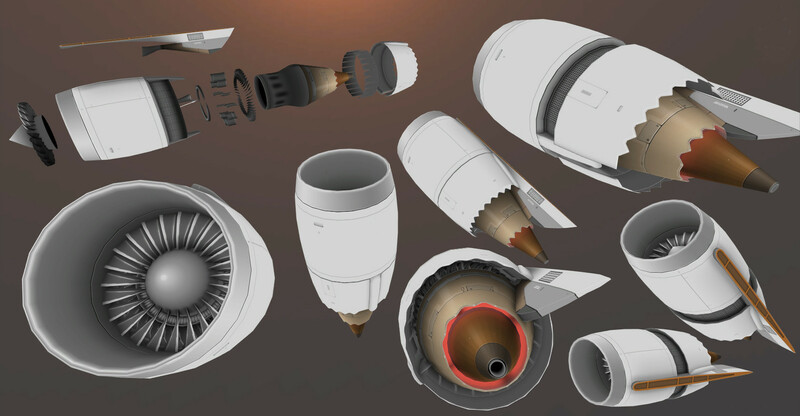 * Added D-30F7 turbojet engine. Perfect when brute force is required, now used on I8-L.
* Added F119 low-bypass turbofan featuring 2D thrust vectoring. Extreme control authority, used on new YF-28 example craft. 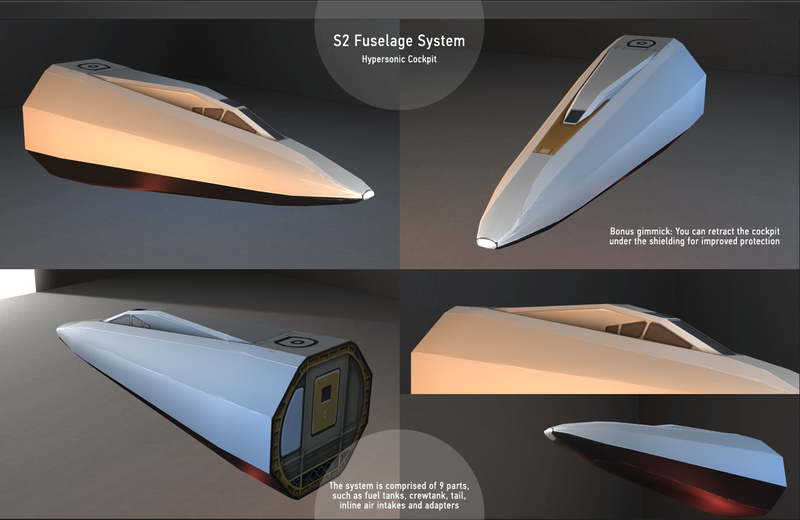 * Added SABRE Engines in 1.25m and 2.5m sizes, featuring plugin powered, separate twin modes of operation, and complementary structural and intake parts. 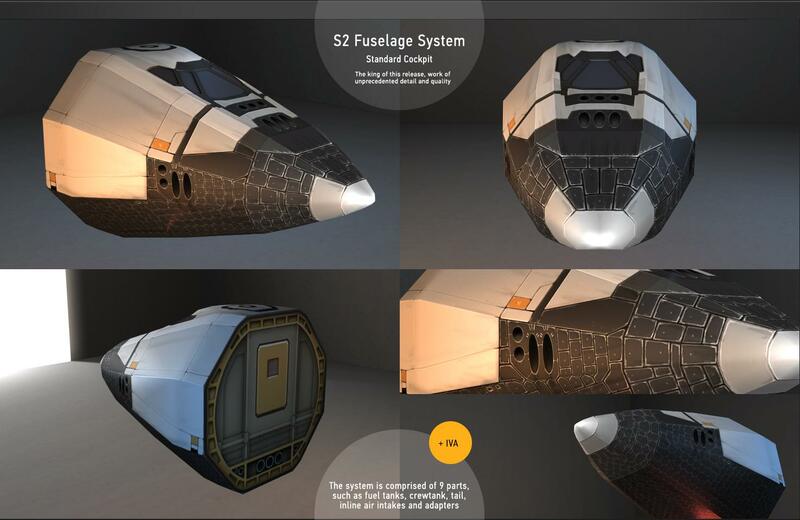 Perfect engine for SSTO designs, used on several updated & new example crafts. 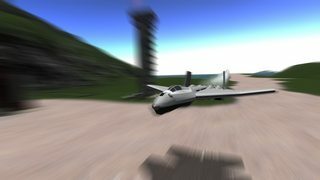 * Added VA1 VTOL jet engine, used on new VX-1 example craft. * Added a matching nosecone part for VS1 VTOL engine and intake part for VA1 VTOL engine. * VTOL Engines are now powered by Firespitter plugin allowing extensive and easy control over engine rotation. * Where suitable (SABRE, ramp), intakes are using animated variable geometry dependent on air speed (powered by KineTechAnimation plugin). * Vastly improved thrust vectoring module that takes into account all engines present on aircraft at once and controls each independently, allowing thrust vectoring to be used to assist in roll maneuvers (!!!) and overall improving stability and efficiency of thrust vectoring engines. Everything also returns to the neutral state upon thrust vectoring switch off, instead of getting stuck in the last position. 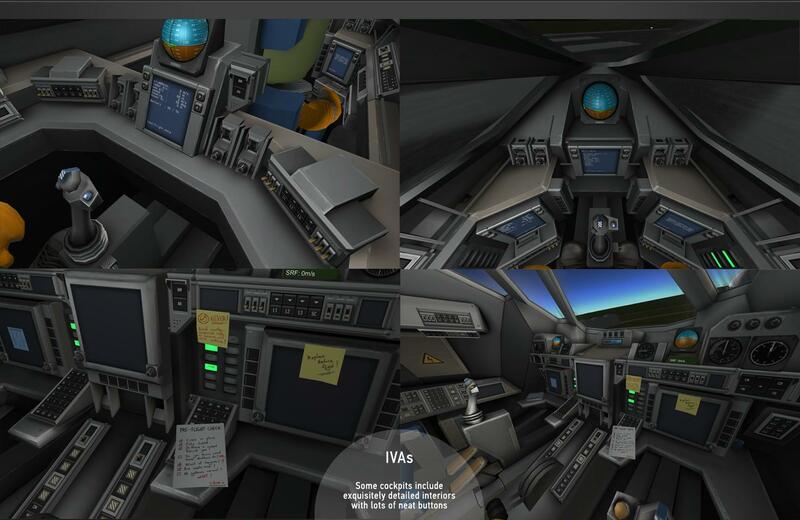 * MK2 cockpit IVA performance improved. * S2 cockpit RCS ports now functional. * Center of mass on all wings set to attachment node to improve stability. * All animated parts are now using vastly improved generic animation module by Firespitter that allows in-editor toggling of state (e.g. 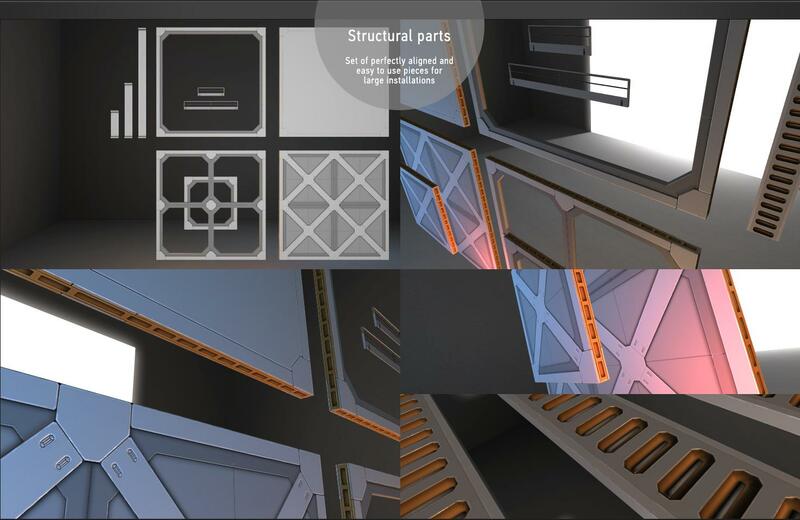 for cargo bay doors), toggling in EVA where applicable (e.g. ladders), action names being displayed in action group editor, ability to reverse animation mid-playback, and much more. * Added 8m cargo hold. * 7 new wing parts: large wingtips, winglets and stabilators. * Added structural & LF tank varieties in 2m and 5m (more convenient than stock pieces of quite weird length). * Added normal and raised tail sections. * Added MK2 to 2x1.25m bicoupler structural adapter. * Added inline RCS monopropellant tank. * Added 2m & 6m Cargo bays. * Added S2 to 4x1.25m adapter in structural and LFO versions. * Added S2 to 2x2.5m adapter in structural and LFO versions. * Added intake-less S2 to S2W adapter in structural and LFO versions. * S2W Intake Adapter airflow fixed. * S2W Intake Adapter drag fixed. * Added S2 to 3.75m adapter in structural version. * Added enormous S2W cargo bays in 2m and 6m versions. * Rotated Radial ACU/ASAS so they can be told apart in Editor parts list. * Added long-requested shielded docking port. * Added aerodynamically shielded R12 RCS Thruster Block and R1 Linear RCS Port ports. * Added R1A Air Thrust Nozzle that can be used in air-powered atmospheric reaction control system for VTOLs (powered by ResGen plugin). * Added long-requested alternative pitot circular intake. * Added surface-attached diverterless intake. * Added two variable-geometry ramp intakes: both can be surface attached, one features engine mount on the back. * Added intake/engine mount matching aforementioned intakes. * Added airbrake part (tied to brake action group, can be rotated to variate the amount of drag produced, can be toggled or held open temporarily). * Added radial RCS tanks in 2 sizes, matching new RCS blocks in style. * Added triangular structural panels allowing for much more freedom in builds. * Added A1 floodlight coming in as solo piece and in 4x & 8x arrays. * Added configurable info drive part that allows you to write information about your crafts (action group descriptions, optimal ascent profiles, background stories) that can be displayed to anyone during flight. Used on every example craft. The notorious FAR bug with spontaneously exploding delta wings is solved completely (it turns out mesh colliders with triangular surfaces aren't supported). FAR configs merged with stock configs, no need to install them separately anymore. MK5 cockpit hatch obstruction issue completely fixed. Unfortunately, the solution involved offsetting the part, so you will have to reattach that cockpit on all your crafts. Fortunately, in contrast with wings, that would be easy to do. Further rebalancing of some parts. 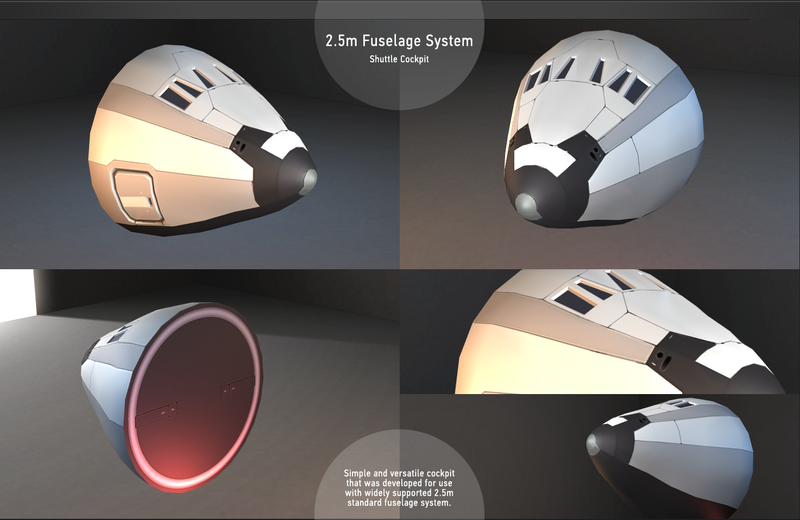 Added new example craft: I8-L Bradbury, supersonic crew transport capable of taking 12 passengers on board. Fixed the shading issues on S2 cockpit model. Complete rebalancing of part mass, crash tolerances, capacities and other parameters. Should result in much more sturdy and nice flying crafts. Warning! Wings structure had to be changed to solve the main source of issues with FAR. Point of origin was moved to attachment point for all wings (with the move compensated through CoMOffset parameter). Unfortunately, this can break existing modular wing setups you are using. Won't happen again. Restored C125 adapter that was mistakenly removed onwards from R2. 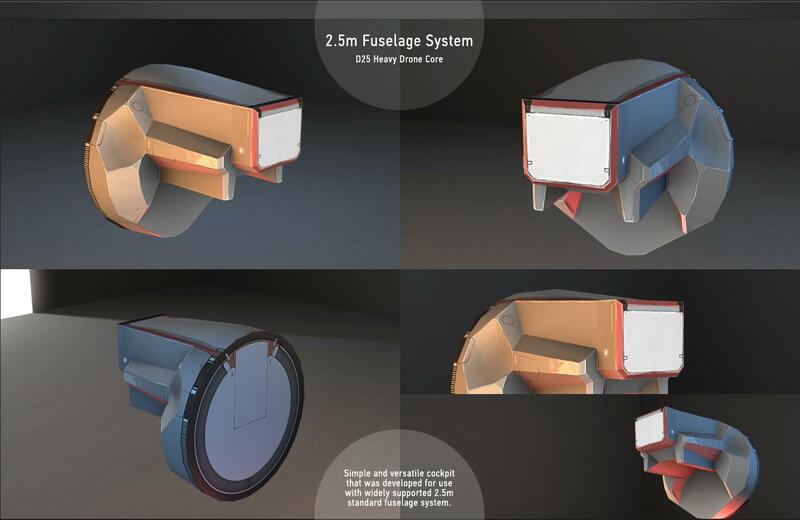 Fixed large structural S2 fuselage section model, should no longer exhibit z-figthing issues. 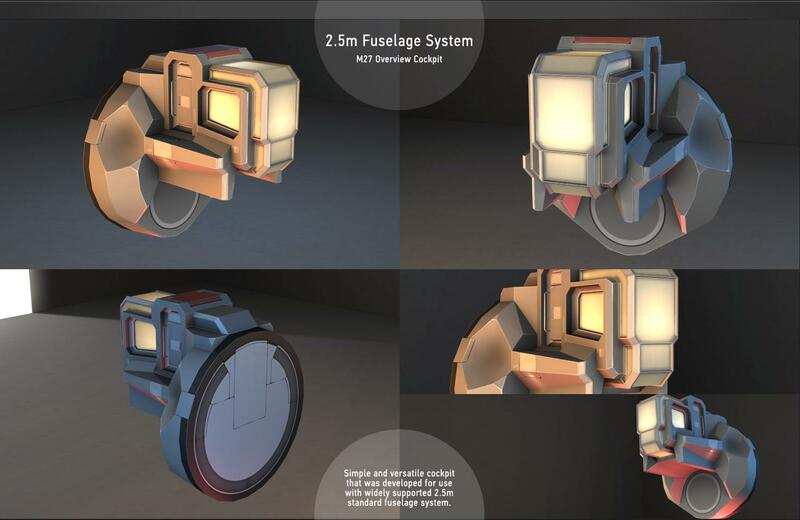 Fixed interior display emissive animation to be less noticeable. Texture improvements on some parts. Lots of config fixes to improve balance. Fixed some config errors (mismatched MK4 adapter node, wing naming, S2 LFO tank naming, HW21 lift values). First iteration of FAR-compliant configs by Taverius added to the package. New part: 1.25m to MK2 adapter. Second milestone release, 85 parts (6 pods, 3 IVAs). 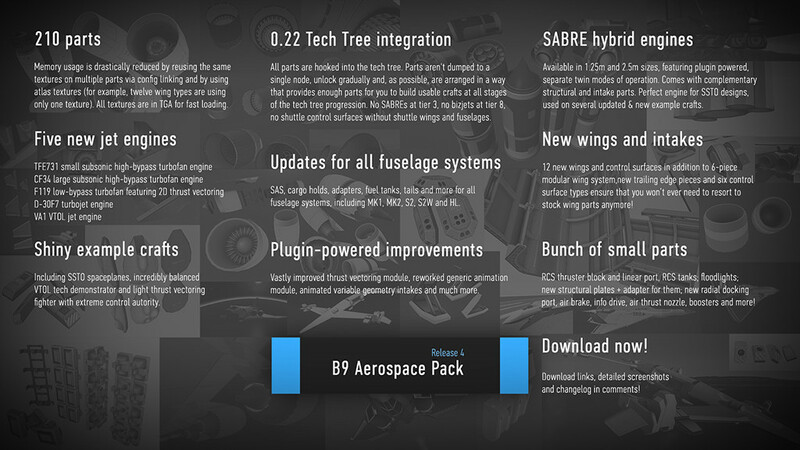 First release, 12 parts (2 pods, 1 IVA). Start by going through example crafts to familiarize yourself with new parts. Want to build VTOLs? Fly VX-1 first, note how air thrust RCS nozzles, SAS and engines are used there. 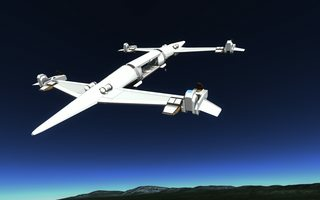 Want to build cargo SSTO? Check SCDV, etc. You can interrupt all animations mid-playback thanks to new animation module, put that to good use. CF34 engine has reversers, make sure to play with that. Click on images on top to open high-resolution versions. Use struts to secure HL fuselage extension sections. As non-linear craft hierarchy is not supported yet, I had to make extenders as separate branches with one attachment point (otherwise they won't work as a straight fuel line). Obviously, that can lead to some funny bending, especially if you are using, say, 10 meters of extended sections and have some heavy wings on them. Struts will help. By the way, we have fancy new struts in R4.0. You can press the buttons on IVA displays. Yes, with the mouse. Click onto windows in IVA views, I have set up additional view points for each IVA, and you will be transferred to a different point upon double-clicking on a proper area. For example, you can move to the front to get a good wide look from M27 windows, or you can click onto the right section of the glass in the MK2 cockpit to press your head against it and peek at what another pilot is doing. You can toggle VTOL mode on VS1/VA1 engines by right-clicking them and choosing the context menu option. But best option is to bind raise/lower actions to action groups! You can toggle lights in the windows on most cockpits by right-clicking them. You can toggle the lighting and protective shielding on S2 crew tank. You can toggle the lighting on new modular ladders, it looks great and helps in the darkness. Use HL tail sections carefully, only open the ramps when fully stopped or you are risking tearing your craft apart. Don't be afraid to overlap new wings with each other, they are designed precisely with that in mind. Triangular parts of their cross-sections are always situated outside of 4m boundaries and aren't part of the collision mesh. Strut them together if you are using multiple lines to prevent unsightly independent bending. I recommend to install KW Rocketry and TaverioÃ¢â‚¬â„¢s Pizza and Aerospace mods for vastly improved selection of quality rocket and aircraft parts. Really, having a proper selection of 2.5m fuel tanks, a whole new, absolutely essential 3.75m fuselage system, proper selection of canards and so on is a must, you won't understand later how you managed to play without that. So, good luck and have fun! I'll be waiting for your feedback. The archive includes Firespitter.dll plugin that was not modified in any way and is used under permission of original author, Snjo. Additional thanks go to Taverius for his great help with the balancing, dedicated FAR configs, and testing of the parts, as well as general advice on development. How was your work project? I'm so glad you had resolve and time to work on your parts for everyone, they look great! Can't wait to use them. Awwwww, dang. There went any chance of sleep for me this weekend. Amazing work!! Sorry, homework! Bac9 has just arrived with a new shipment of AWESOME. Pretty cool looking stuff, really like the style and feel you are going for. Once again, very very cool. I kept watching the Development thread before the forums went down waiting for the next revision! Can't wait to try these out. The asymmetric style really just looks awesome and your parts were also functional, making for an awesome set! This makes something I own very hard. You are legitimately the most skilled, detailed, and focused modder I have ever seen across any game. The IVA spaces are absolutely fantastic, and your unique part style manages to blend into the vanilla game well while still being its own thing. Holy crap, it's like Christmas and birthdays all rolled together and given illegal fireworks. Quoted for truth. To be honest I wasn't too keen on the first set of cockpits however the new ones in the R2 are just too good to pass up. can wait to see what people dream up whit these. Can you include some craft? Hands down the best detail on any custom parts I have ever seen since I started playing this game. My hat if off to you sir! Well this is just incredible. Any chance you could take a look at this thread and maybe see about uploading some parts for people to drool over? Every mod wants to be this cool when they grow up. Fantastic work! I'm curious, is there any form of transition piece for the S2 between the regular body and wide body pieces? I can't seem to find the. I also would suggest some form of RCS tank when you get around to it. Those are my only concerns/questions/suggestions after having messed with it for the last couple of hours. Edit: Upon further playing I also would like to recommend an inline docking port. I greatly appreciate all this work you've done and appreciate your desire to share with others. Obviously I don't know what you have been working on that you haven't shared yet so let me know if the things I've said are things you've considered, rejected, ect. Again thanks for all these parts! You sir are a genius, and totally should be a member of development team - then we all would have insanely awesome looking parts to play with. Found a small issue though. The S2 LFO and Fuel tanks have the same name in their part.cfg files. These are beautiful, but the parts don't hold together very well at all. I would say an unusual amount of flexibility along one axis, as if the parts only connect on one node. Shouldn't the fuselage connect or adhere to the adjacent part completely?